The 2006 CKCU Ottawa Folk Festival presented an appealing variety of entertainment ranging from American alt-country sensation Steve Earle to singer-songwriter Ferron to the Burundi-inspired The Mighty Popo Band. Blues, Celtic, klezmer and gospel artists and a ukulele virtuoso demonstrated the diversity of folk music. The 25th anniversary of Rasputin’s Folk Café was celebrated in fine style, while former Bronson Avenue neighbourArthur McGregor of the Ottawa Folklore Centre, received the Helen Verger Award. This year also marked the departure of Executive Director Gene Swimmer who had made an exceptional contribution to the festival in this role since 1996. Gene was recognized by many people on the main stage and was presented with mementoes for his 14 years of dedicated volunteer service. Festival goers had many different ways to participate, whether singing with the Terry Penner Festival Choir, performing at the Ottawa Folklore Centre’s open mic session, joining a singalong, or learning to play the harmonica, ukulele or pennywhistle. There were also chances to dance to musical styles from Cuban to Cajun to klezmer, and to perform with a community drumming circle. 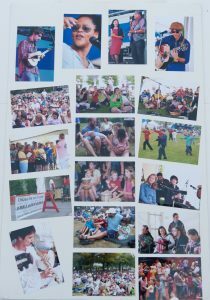 The CKCU-FM Family Area was bigger and better than ever and featured two of the best children’s acts onthe circuit: Fran Avni and Sho Mo and The Monkey Bunch. As usual, kids could make musical instruments, and participate in crafts workshops. Kathy Armstrong organized the Kids Weekend Drumming Ensemble, giving kids a chance to learn and rehearse African drumming and perform during the Sunshine Parade held on Sunday afternoon. The CUPE EnviroTent offered ongoing talks, demonstrations and hands-on activities for adults and children. Topics included renewable energy, raw vegan foods, attracting butterflies to your backyard, water, patchwork quilting, terminator seeds, and rekindling our relationship with Mother Earth. On Thursday, August 17 two separately ticketed downtown shows launched the 13th festival. An all-star song circle of Lynn Miles, Ian Tamblyn, Bill Bourne and Erick Manana celebrated the 25th anniversary ofRasputin’s at Library and Archives Canada. Many wonderful memories and amusing anecdotes were shared at the tribute and owner Dean Verger was in great spirits. A lively show at the Capital City Music Hallfeatured a dynamite quadruple bill of The Sadies, Ridley Bent, The Agnostic Mountain Gospel Choir andAmy Millan. Friday afternoon in Britannia Park at the Metro Ottawa Stage began rhythmically with a Community Drumming Circle with Kathy Armstrong, Leo Brooks and Rusty Eckland. The evening main stage opened with Ottawa Folklore Centre owner Arthur McGregor performing an acoustic version of “O Canada” in his inimitable ragtime style. Arthur was followed by the Kelli Trottier Band, the wonderfully named ensemble The Agnostic Mountain Gospel Choir, Erick Manana, ukulele virtuoso James Hill, festival staple Ian Tamblyn, and bluesy duo Dawn Tyler Watson & Paul Deslauriers. Steve Earle received a rousing welcome from the enthusiastic crowd who responded to his extraordinary and deeply personal brand of country music. Alternative evening programming took place in the World Harmony Stage inside the Ron Kolbus Lakeside Centre. A song circle was held with Mark Wilson, Old Man Luedecke (a surprisingly young banjo songster), Zach Stevenson (well known for his interpretations of Phil Ochs material), Rachelle van Zanten and Amy Millan. At an After Party held at the Travelodge Hotel Ottawa West, the entertainment included Jan Purcell and Pine Road, Erynn Marshall & Chris Coole, and Robert Michaels. On the CUPE Main Stage, the day opened with a Family Concert with Sho Mo and The Monkey Bunch.Mike Regenstreif hosted the Fiddle Frenzy session with Dirk Powell, the April Verch Band, Sarah Burnell, Erynn Marshall & Chris Coole, and the Kelli Trottier Band. Dawn Tyler Watson & Paul Deslauriers, DiggingRoots, Rachelle Van Zanten and Andy Cohen participated in the Saturday Blues session hosted byRich Warren. The Canadian Spaces session hosted by Chopper McKinnon featured artists often featured on the CKCU-FM folk music show of the same name: Charlie Sohmer, Ferron, Paul Mills, Holmes Hooke andStella Haybukhai. The magnificent ensemble, The Maple Leaf Brass Band, performed with great gusto beside the main stage. Over at the Bowie Electrical Stage, four separate groups appeared in concert: a double bill with Mike Evin andZach Stevenson, the funky Indian-jazz fusion band Autorickshaw, Sarah Burnell, Paul Mills & Friends, andTiiu Millistiver and ElizaBeth Hill. An excellent spoken word session, Word Play, followed with the wordy talents of master storyteller Holmes Hooke, beat poet Lillian Allen and lowercase poet bill bissett. At the World Harmony Stage in the Ron Kolbus Lakeside Centre, a CBC Live Fuse show hosted by Alan Neal was taped featuring Ridley Bent along with Ndidi Onukwulu & Madagascar Slim. Nubia Cermenohosted a lively Cuban Dance session with Valle Son. Later in the day, there was more dancing when Steve Pritchard hosted Cajun Dance #1 session with Grouyan Gombo. Two separate concerts showcased the talents of Erik Manana, The Agnostic Mountain Gospel Choir and Dan Frechette. Kathy Armstrong also hosted a Kids Participatory Drumming Ensemble. A diverse day of entertainment took place on the Metro Ottawa Stage. Two groups of musicians appeared in concert: Balfa Toujours and the Kelli Trottier Band, and The Supers and DiggingRoots. The Nature of Things session hosted by Karen Flanagan McCarthy featured Ian Tamblyn, Sheila M Ross and ElizaBeth Hill. The Nature of Strings session, on the other hand, showcased James Hill, Old Man Luedecke and Silk Road Duo and was hosted by Rachel Hauraney. The day ended with a session titled It’s Latin to Me featuringValle Son and the Robert Michaels Band. At the Loeb Glebe Stage, many musical explorations took place, beginning with the Musical Journeys session hosted by Steve Pritchard featuring Tiiu Millistver, Andy Cohen and Dan Frechette. Gene Swimmer hosted the Director’s Choice session with Ridley Bent, James Hill, and Dawn Tyler Watson & Paul Deslauriers. Two separate concerts showcased Eileen Laverty and Silk Road Duo. Erin Barnhard hosted theAppalachian Echoes session with the Dirk Powell Band, Erynn Marshall & Chris Coole, and Old Man Luedecke. The fascinating East Meets West session hosted by Rachel Hauraney included Autorickshaw, Silk Road Duo and renowned sitar player Vishwa Mohan Bhatt, who was once the teacher of Harry Manx. There was plenty happening at the Rogers Stage. Colin Henein hosted the Music from the Glen session inspired by the CKCU-FM radio show, which featured Orealis, Eileen Laverty, Sarah Burnell and April Verch. Pat Moore hosted the Salutin’ Rasputin’s session with Charlie Sohmer, Stella Haybukhai, Rick Hayes and Don Fletcher. The Big Smoke session hosted by Bill Stunt featured Toronto performers Ron Sexsmith, Mike Evin and Amy Millan. Ron Moores hosted the Back 40 Live session inspired by his traditional country, western and bluegrass music show on CKCU-FM, featuring Amy Millan, Ridley Bent, andDallas & Travis Good of The Sadies. The Songwriters’ Songwriters session featured the calibre of songwriters you might expect: Eliza Gilkyson, Ferron, Ron Sexsmith and Rich Warren. The day ended with a solo concert from Eliza Gilkyson. The CKCU-FM Stage hosted music as diverse as the station’s programming. MaryLou Hulan and Monica Wolfe kicked things off with the Kindermusic session. Separate concerts were performed in a range of styles byFran Avni, Sho Mo and The Monkey Bunch, Folka Voca, Silk Road Duo, ElizaBeth Hill and Andy Cohen. The Ottawa Folklore Centre Stage entertainment opened with a concert with Folka Voca. Two educational sessions followed: Singing Tips for Everyone hosted by Lee Hayes, and Learn to Play the Harmonica withMiles Howe. Arthur McGregor hosted the song circle session Rise Up Singing. The day ended with an Open Mic session allowing participants the opportunity to perform onstage to a receptive audience. In the CUPE EnviroTent, sessions were held to educate people in environmental topics including Renewable Energy for Home Owners with Sean Twomey of Arbour Environmental Shoppe, Healthy Lifestyles with Raw Vegan Food with Natasha Kyssa of SimplyRaw, Bringing Your Garden to Life with Sandy Garlandof Fletcher Wildlife Garden, and Environmental Politics with David Chernushenko of the Green Party. The Family Craft Area provided lots of fun for families including the following sessions: Drum Making for Kids with Gaelen Hart, Making Paper Bag Puppets with Liz Murphy, Making Jewellery with Heather Boyd of Filament, and Making Wire Art with Emily Wood. On the CUPE Main Stage the night kicked off with the lively French-Canadian ensemble Mauvais Sort and continued with Ridley Bent, the Cajun group Balfa Toujours, and the accomplished flamenco guitarist Robert Michaels. Two superb singer-songwriters at the top of their game, Ferron and Ron Sexsmith, followed with excellent solo sets. Alternative evening programming on the World Harmony Stage opened with the mesmerizing Autorickshawwhose music is a wonderful melange of South Indian classical music, Bollywood-tinged jazz standards and Indo- jazz originals. The Supers and the popular alt-folk group The Sadies rounded out the night’s entertainment. The After Party at the Travelodge Hotel Ottawa West showcased a diverse cross-section of roots music withNdidi Onukwulu & Madagascar Slim, April Verch and DiggingRoots. On Sunday morning, the First Annual Musical Festival Brunch featured great food and the talents of Frida’sBrow, Ndidi Onukwulu & Madagascar Slim, Michael Munnik, Ann Downey and host Cam Wells. AnOttawa Folklore Centre Celebration featured Ian Tamblyn, Eliza Gilkyson, Jan Purcell and Pine Road, Eileen Laverty, Chris MacLean and host Arthur McGregor. An Afternoon Raga showcased the renowned sitar player Vishwa Mohan Bhatt. The East-West Extravaganza hosted by Eric Stein featured Beyond the Pale, Silk Road Duo and Galitcha. Four excellent concerts were held on the Bowie Electrical Stage featuring Dan Frechette and Old Man Luedecke; Kelli Trottier Band and Pat Moore; Jan Purcell and Pine Road and Zach Stevenson; andVishwa Mohan Bhatt and Galitcha. The session Speaking Words featured poets John Akpata, Sheila M Ross, Lillian Allen, and bill bissett. The World Harmony Stage in the cool confines of the Ron Kolbus Lakeside Centre was a happening place. The entertainment started with concerts with Mostly Harmless and Mark Wilson, as well as a group comprisingErynn Marshall & Chris Coole and Andy Cohen. Two dance sessions celebrated dance styles: Klezmer Dance (Susan Watts & KlezKanada All-Star Dance Band with instructor Michael Alpert); and Cajun Dance #2 (Balfa Toujours and Jody Benjamin). Sho Mo and The Monkey Bunch were the first group to appear in concert on the Metro Ottawa Stage;Mauvais Sort was the second. The Tout le Monde session hosted by Karen Flanagan McCarthy featuredBalfa Toujours, Mauvais Sort and Erick Manana. Sharon Fernandez hosted the session 2 Pianos, 6 Handswith Marilyn Lerner of KlezKanada, Braydis (Valle Son) and Mike Evin. Cam Wells hosted the Musical Traditions session with Ndidi Onukwulu & Madagascar Slim, Kelli Trottier Band, and Erynn Marshall & Chris Coole. Laurie-Ann Copple hosted the Lost and Found session on the Loeb Glebe Stage with Eve Goldberg, Eileen Laverty and Holmes Hooke. The East-West Blues session showcased the considerable talents of Vishwa Mohan Bhatt, Rachelle van Zanten, Rick Fines and host Sharon Fernandez. Carolyn Sutherland was the host of the session titled African Guitar Pinnacle with Madagascar Slim, Erick Manana and The Mighty Popo. The amusingly titled Stringed Things session was hosted by CKCU Ottawa Folk Festival volunteer Zita Murphy-Brascoupé and featured Vanya Zhuk, Robert Michaels and The Mighty Popo. The day ended with the Galaxie Rising Stars session featuring musical luminaries Mark Wilson, Rachelle van Zanten andMichael Munnik. On the Rogers Stage, Morna Ballantyne hosted the Politically Direct session with Eliza Gilkyson, Lillian Allen, John Akpata and Alise Marlane. A Phil Ochs Tribute was hosted by his sister Sonny Ochs and featured Zach Stevenson (who had formerly appeared in a Phil Ochs musical play), Eve Goldberg and Alise Marlane. Host Mike Regenstreif led the Common Ground session with the Dirk Powell Band, Dan Frechette and Robert Michaels. Doc (Peter Conway) was on hand to host the Doc’s Pick session showcasingEliza Gilkyson, Rick Fines and Jennifer Noxon. The First Verses Only session, hosted by Mitch Podolak, featured Sneezy Waters, Arthur McGregor, Andy Cohen, Ann Downey, Dan Frechette, Eve Goldberg andRick Fines. The audience at the CKCU-FM Stage was treated to concerts with Silk Road Duo, Fran Avni, Old Man Luedecke, Holmes Hooke and Klezmer: The Next Generation. The last item on the folk agenda was the annual, always fun, noisy and wonderful Sunshine Parade, a musical percussion-rich procession of kids of all ages that wound its way to the main stage. On the Ottawa Folklore Centre Stage several instructional sessions were presented: Blues Guitar for Beginners with Andy Cohen, Learn to Play the Ukulele with virtuoso James Hill, and Learn to Play the Tin Whistle with Andy Daub. The day ended with an Open Mic session. The CUPE EnviroTent was the site of several information sessions with environmental themes: Water: A Basic Human Right? with Tony Clark of the Polaris Institute, Food Security with Juniper Turgeon of Just Food, Patchwork Quilting with Joanne Hyslop, Terminator Seeds with Pat Roy Mooney of the ETC Group, and Renewing the Sacred Balance with Kristina Inrig of the Faith and the Common Goodorganization. Little ones in the Family Craft Area were treated to the following sessions: Drum Making for Kids withGaelan Hart, and Making Paper Bag Puppets with Liz Murphy. The CUPE Main Stage evening concert opened with a lively Klezmer showcase featuring Beyond the Pale and continued with the Cuban sounds of Valle Son and American singer-songwriter Dar Williams. The Terry Penner Festival Choir with Mike MacDonald graced the stage with a typically uplifting performance. The Burundi-flavoured pop of The Mighty Popo was followed by an American husband and wife who performed separate sets: Greg Brown and Iris DeMent. Contemporary singer-songwriter Greg Brown performed in three previous Ottawa Folk Festivals, while this was the first performance here by his spouse, country folk performerIris DeMent. Alternative evening programming was found on the World Harmony Stage in the Ron Kolbus Lakeside Centre. The featured sessions were Cajun Dance with Balfa Toujours, Frida’s Brow, and Super Session 2006featuring Rick Fines, Rachelle van Zanten, James Hill, Eve Goldberg and Miles Howe. The music continued after the festival gates closed Sunday night with two Festival Wrap-Up Concerts on Monday night. At the Black Sheep Inn in Wakefield, Quebec, a double bill featured singer-songwriters Dar Williams and Dan Frechette. The Dirk Powell Band whooped it up at The Bayou in Ottawa.